While the engine was still in the chassis, we began removing everything that could be removed. Rust and scale can be seen in the cooling passages (red arrows) of this otherwise excellent condition head. Note: Just because a machine shop has dipped-cleaned your engine doesn't mean it's clean. It is important to rinse and wipe the cylinder wall, oil passages, etc. with fresh mineral spirits to make sure no grit is left over. After thorough cleaning inside and out, check the cylinder block for warpage with a steel straightedge and feeler gauge. If the straightedge (T-square, steel ruler, etc....no wood) is placed over the bores (from one end to the other) there should be no more than .003 in, or .08 mm, anywhere along its length. "Perfect blocks, of course, have no clearance under a straightedge for the feeler gauge to slip in, but few are that good. Do this measurement several times, while positioning the straightedge along the block edges and diagonally, in both directions. Blocks that prove to be distorted can be resurfaced at machine shops, but any metal removed will affect the compression ratio, lifter-to-rocker arm distance and piston-to-valve clearance, so be careful not to exceed manufacturer's specifications. Next, the block must be checked for cracks. While many cracks can be detected by eye (especially around valve seats and cylinder walls) it is best to take the block to a shop where it can be magnafluxed, a procedure that uses a strong magnetic field around the block. The block is sprayed with a fluorescent solution containing ferromagnetic particles and an ultraviolet light is shined over the area. The particles will migrate into any cracks or imperfections, making them easily visible. Other ways of showing up cracks include fluorescent penetrants, dye penetrants and X-rays, but the most common is magnaflux. The exhaust ports in this head are filthy...must be cleaned using solvents, dipping, wire brushes...anything that works. All blocks have Core Hole Plugs, commonly called "freeze plugs." For many years it was believed that these pressed-in plugs were put there to pop out if the coolant became frozen in winter, thereby saving the engine block from cracking apart. This never was true, because there is no way to protect the intricate cooling passages of an engine from cracking if coolant freezes. Although mechanics and owners saw some of these plugs pop out when engine blocks froze, no such design was ever intended. The so-called "freeze plugs" are, in fact, plugs that seal up core holes in the block that designers put there for several purposes. Some core holes are put there to provide a rigid point of attachment for machinery jigs that hold the engine precisely during drilling and boring operations. Other holes are there to provide access to drill or bore oil galleries and other fixtures. Once these operations are completed the holes need to be sealed, and that is the job of the pressed-in plugs. Whenever an engine block is rebuilt the core hole plugs should be replaced. Because they are thinner than the surrounding casting the plugs tend to rust out sooner, so failure to replace them often results in leaks. As pistons move up and down they exhibit infinitesimal amounts of wear on the cylinder walls. After about 75,000 miles, for typical engines, the pistons wear away enough of the cylinder wall so that a small ridge forms at the top. This forms because the uppermost ring is set below the top of the piston and the cylinder wall remains its original inner diameter over that distance. 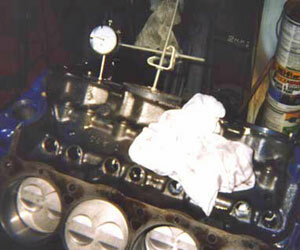 Any ring ridges must be removed during engine rebuilding before the cylinder walls can be refinished. Once engine blocks are cleaned and checked for cracks, cylinder walls must be inspected for scratches and out-of-round or taper (cylinder wall diameter smaller at the bottom than at the top). Various gauges are used to measure these conditions and only afterwards can the right decision be made whether to rebore or fit new rings only. Most V8 engines allow up to .012 in. (0.30 mm) taper and up to .005 in (0.13 mm) out-of-roundness. Out-of-roundness in cylinder walls makes it impossible for the rings to seal properly. Heavy oil consumption will result in this situation. Engines that are rebuilt with out-of-specification taper will generally experience "ring float" and tipping of the piston as it travels from the bottom of the cylinder to the top. The rings, compressed against the wall at the bottom, don't have the time to expand in the wider upper section because of the speeds the parts operate. The rings "float" momentarily and the piston tips slightly, causing poor compression and probably damage to the cylinder walls, rings and piston. Whether a cylinder wall's characteristics are within specifications or not, or if the cylinder has been rebored, the surface of the walls must assist the "break in" or seating of the new rings. Contrary to popular belief, a shiny smooth cylinder wall is not desirable. New rings have microscopic tool thread marks around their edges. The walls must have some texture (tiny scratches) ground into it for the rings to take a "set" within a reasonable amount of time. That is, as the rings travel up and down, both the wall and rings will wear a small amount. High spots on the ring will tend to wear off against the scratches on the wall, allowing the low spots to contact the wall. Various honing tools are used to properly prepare cylinder wall surfaces and all manufacturers specify the scratch depth and pattern. Although simple in appearance, pistons are actually complex devices that require exacting tolerances for proper operation. Pistons and their associated parts undergo extreme loads and temperature changes while engines are running and any out-of-tolerance condition will result in premature — or catastrophic — failure. Note the use of the dial indicator to properly locate top dead center. Don't trust the timing marks until you know they are correct. Whether or nor a piston should be replaced is determined by close examination of its ring grooves, top, pin bosses and skirt. Pistons that show any signs of burning, scuffing, scoring, corrosion or cracking should be discarded. Ring grooves hold the rings in place, of course, but their depth and width are critical to proper ring control. Excessive groove depth will reduce expander pressure and excessive width will allow rings to "tilt" as they move, causing wear and compression problems. When rings are installed in a cylinder, a certain amount of end gap must exist in order to allow for thermal expansion. This gap is typically .003-.005 inches (0.08-0.10 mm) for each inch of bore diameter. Accurately fitted pins (wrist pin, rod pin, etc.) 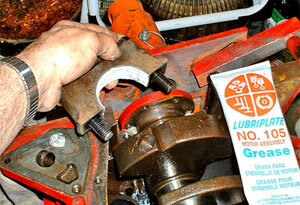 provide proper oil clearance in both the pin bosses and rod bushing (when bushings are used). Most modern engines utilize press-fit-in-rod, oscillating-in-piston pin configurations, but alternative designs include full-floating, oscillating-in-piston clamped-in-rod, set screw type and bushed piston or rod. Whatever the design, the piston bosses must be drilled perfectly in line and the pin tolerance be within a few ten-thousanths inch specification in both piston and rod. If not, the piston/rod will shortly fail, usually inflicting damage to other parts of the engine. 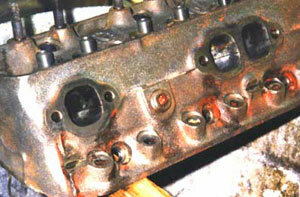 The top of the piston should be examined for erosion and burning. The skirt should not have deep scratches, burrs, burned areas or any other indications that show it has been "slapping" in the cylinder. 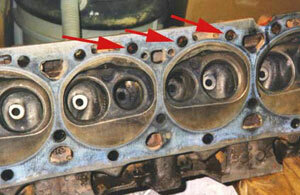 Pistons removed from an engine that is subsequently rebored cannot be used under any circumstances. New pistons that match the rebore size (typically .010, .020, .030 thousanths) must be obtained, as well as rings. Connecting rods are subjected to tremendous loads. Although they are made of very high quality materials, weight considerations necessitate that they be as light as possible. Therefore, after many miles of driving the combination of centrifugal and inertial loads — coupled with heating and cooling effects — causes the big end of the rod to distort. It is important to measure rods for twists and bends before re-using them in an engine. Other problems to look for in rods are bore roundness and diameter. Any "slop" here can quickly result in failure. The bottom end of this engine is spotless and the crankshaft has been polished. Cover this in plastic until it's ready to assemble. The crankshaft is the heart of the engine. It converts reciprocal motion into circular motion and in turn delivers power to the drivetrain. 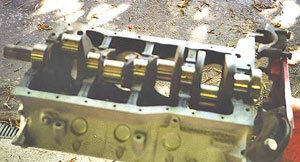 It is held in place in the block by main bearings and the connecting rods are mounted on its journals. The crankshaft's bearing journals must be round, smooth, free from burrs and imperfections, and the shaft itself must be balanced and straight. Oil passages are drilled throughout the crankshaft and these must be clean and free from obstructions. All crankshafts are built to allow a certain amount of regrinding in the event bearing journals are damaged or out-of-round. Manufacturers specify the maximum amount journals may be ground and re-sized, typically .020, beyond which there is too much weakening. 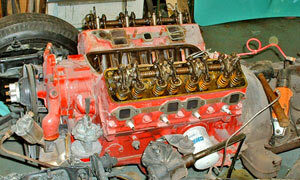 Once a crankshaft has been checked out thoroughly it may be reinstalled, using new bearings and end seals. All bearing caps (main and rod) must be properly torqued to specifications and seals must be seated. Crankshaft endplay must be within specifications, since too little can result in expansion that could crack the block and too much can result in vibration and premature wear of internal components. We put a nice coating of assembly lube on the main bearing caps during assembly. Crankshafts should be stored standing-up or supported along their length. If one is left laying on the floor for a significant time it's mass might take a "set," in which there is a slight bend in the shaft that renders it useless. The flywheel's mass limits vibration and takes advantage of inertia, not to mention that its face provides one of the friction surfaces for the clutch plate. The ring gear on the outer diameter of the flywheel is engaged by the starter and is replaceable on most flywheels. Ring gears may be shrunk in place or welded, sometimes even bolted. Flywheel surfaces must be warp-free and smooth, not to mention clean. They can be measured and resurfaced at most machine shops. A thorough checkout should always be done, whether or not it looks good. 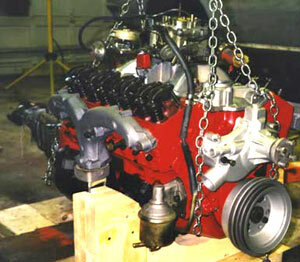 Nothing prettier than a newly rebuilt engine. Engine building isn't hard, but building on incorrectly is easy. The secret to doing the job right is to take your time and double-check each task to make sure you've done it right and measured tolerance or set torque according to specifications. If you build it properly it will run for a long, long time.